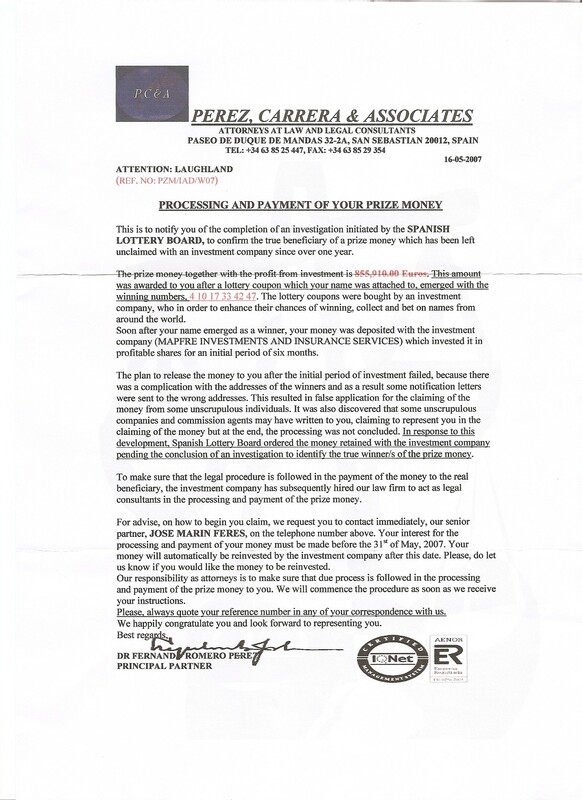 Most of these scams originate from Nigeria however, there are an increasing number coming from Spain. 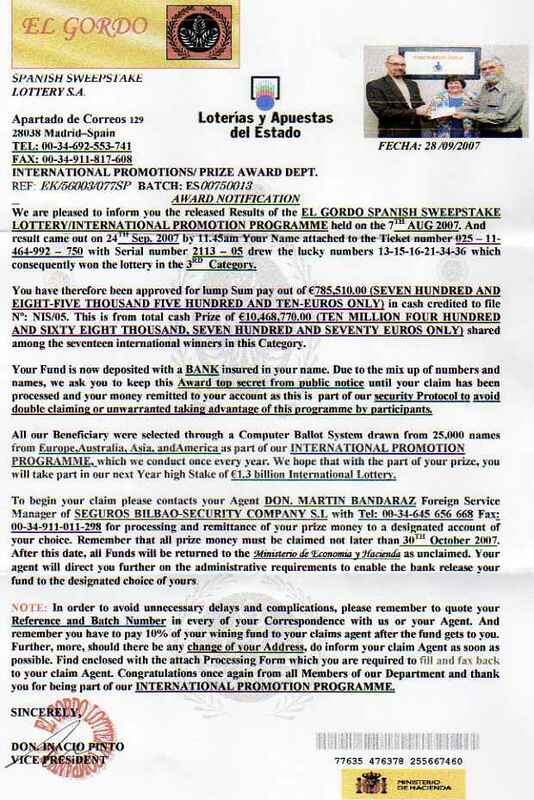 It is NOT unusual to receive a letter in the UK from Spain, claiming that you have won a lottery. You can guarantee that it is a scam. Spanish police have recently smashed a huge gang that have been running these scams. They actually earned millions of Euros doing it - can you believe that people actually sent them money? 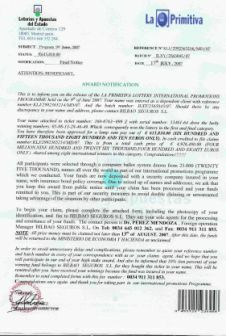 Most lottery scams originating from Spain are run by Nigerians living illegally in Spain however, gangs of Spanish and English have been having a go too. You receive an email claiming that you have won a large prize in a Spanish lottery. In order to claim the prize you need to call a Spanish number. You call this number and it is likely to be a premium rate number on which they keep you talking. It is often a mobile number (all mobiles in Spain begin with a 6). A lottery office would not use a mobile number. When you call the number it is likely that they will ask you for a legal fee to process the claim. It can be anything from 600-3,000 euros. If you send them money – forget it. You will hear no more from them. We did however hear of a case whereby someone sent them money and they had the nerve to call again 2 weeks later and ask for another processing fee. We have heard of people losing in excess of £10,000 to these crooks. Many of these lottery scams are also an attempt to STEAL YOUR IDENTITY. If you really want to give some money away to these scammers, I would rather you send it to me ! If you give them your personal details your bank account may be emptied and loans etc will be taken out in your name. If you receive an email about a lottery win, consider the following. "From 'loteria catalunya international'.... address given as avenida de marquez 115, 30562 murcia, spain..... tel: 011 34 635 193 151.... informing of having won eight hundred and twenty five thousand euros. Notes: No such lottery and the number is a mobile number, you can tell because it begins with a '6'. The address is residential. On calling the number you are asked to send money to cover transfer fees and taxes. This is something that a genuine lottery would NOT ask for..... and they wouldn't write to you, especially if you had never bought a ticket. GRUPO BILBAO SECURITY COMPANY S.L. Notes: Again, the contact numbers are mobiles and the companies do NOT exist. If you call the telephone number - An 01701 number is a premium rate international routing number. Your call will be transferred to somewhere warm and exotic without you even knowing it. Would a company such as this send out unsolicited letters? Would a company such as this use a Hotmail email account? Send an envelope back to them, stuffed with heavy card but with no letter in etc and don't put a stamp on it. This way they will have to pay to collect the letter from the post office. Then email Hotmail and complain that this email address is being used by a scammer. 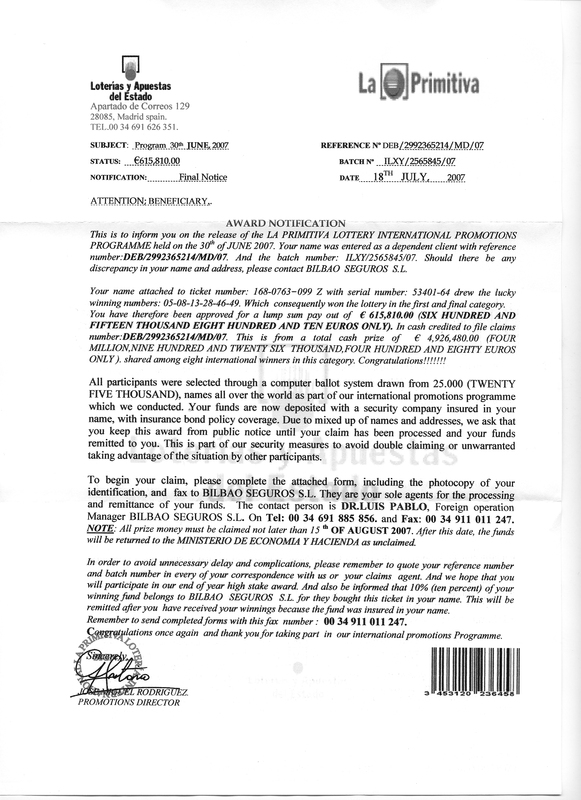 Letter from La Primitiva informing that I have won over €600,000 in LA PRIMITIVA LOTTERY INTERNATIONAL PROMOTIONS PROGRAMME. 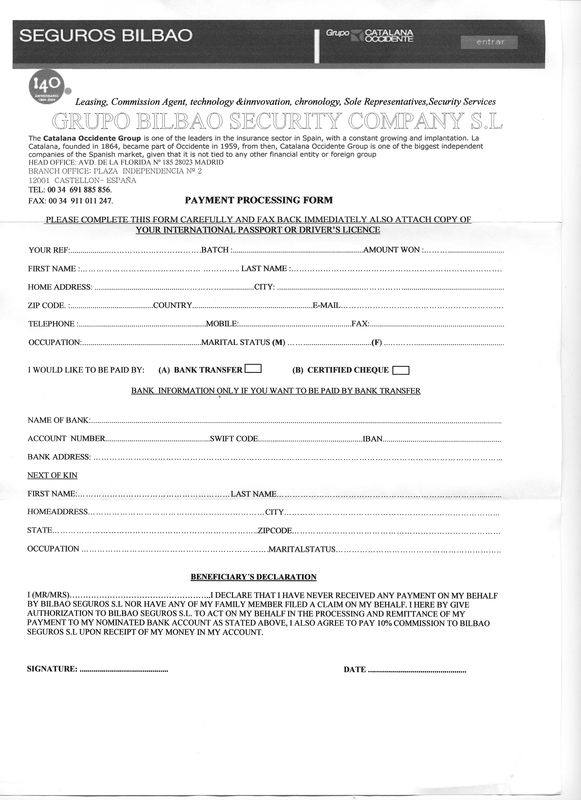 A payment processing form from Seguros Bilbao was included. 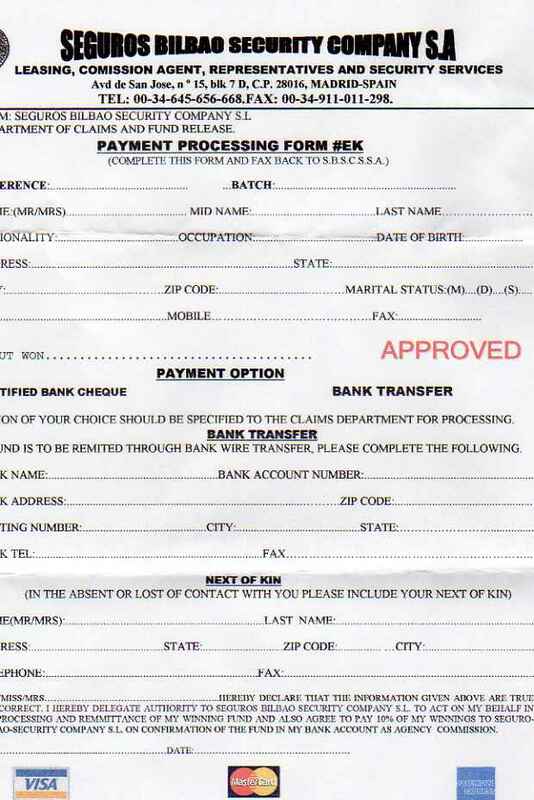 I am asked to fill out this form (on which there is on option to be paid by bank transfer or certified cheque. 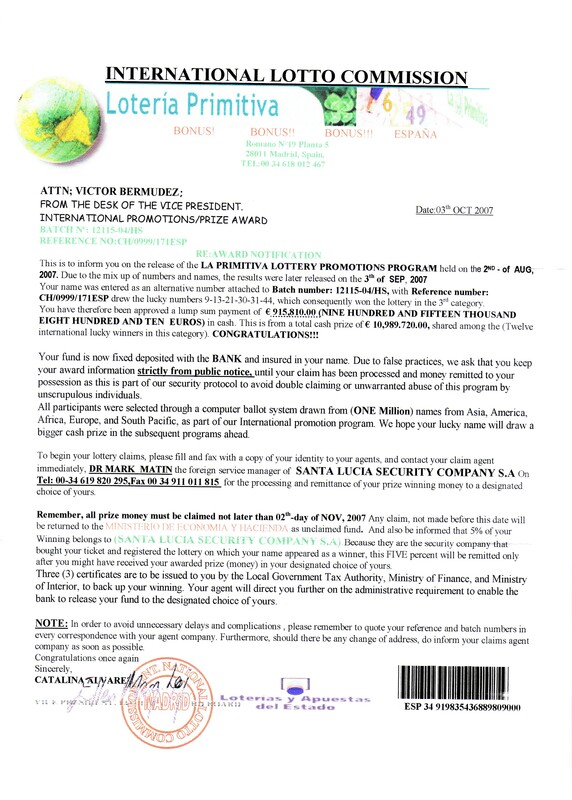 This line reads: "bank information only if you want to be paid by bank transfer" ) and fax this form with a photocopy of my international passport or driver's licence to 00 34 911 010 799 no later than June 29th, 2007, otherwise the funds will be returned to the MINISTERIO DE ECONOMIA Y HACIENDA as unclaimed. There is also a stipulation that the "beneficiary" sign a declaration agreeing to pay 10% commission to Bilbao Sefuros S.L upon receipt of money. Does their contact number begin with a '6'? If yes, it's a mobile.... how professional is that?